SILICON SLOPES, Utah – May 5, 2016 – Domo is heading to San Diego for the Gartner Digital Marketing Conference, May 17–19, 2016. 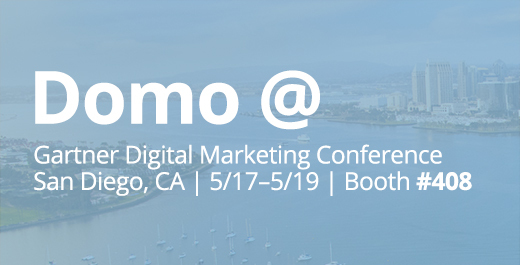 As a platinum exhibitor, the company will demonstrate how marketing leaders leverage Domo to solve today’s most pervasive challenges around data, reporting and business decision-making to optimize marketing’s contribution to revenue. In the exhibit hall, Domo can be seen in action at booth No. 408. Following the day’s events on Wednesday, May 18, Domo will host an evening of hospitality at The Domo Speakeasy. The password-protected party will be held from 5:15 p.m.–7:15 p.m. in Hillcrest C/D at the Manchester Grand Hyatt San Diego. Attendees can pick up the password at Domo’s booth in the exhibit hall. In addition, Domo’s Chief Customer Officer, Heather Zynczak will be presenting a session titled “From Click to Cash: How Marketers Can Master ROI.” Zynczak will help attendees discover how to empower marketers to make real decisions that impact the bottom line by measuring ROI across all channels. She will also demonstrate how data can be leveraged to close the loop and arm marketers with quantifiable answers to marketing’s toughest challenges. For more information, visit https://www.domo.com/company/events/gartner-digital-marketing-conference-2.